Stop for a nice, long look and you realize it’s just an obelisk with arms. It’s like the Washington Monument gone terribly awry, as if three separate foremen had dramatically confused the blueprints. 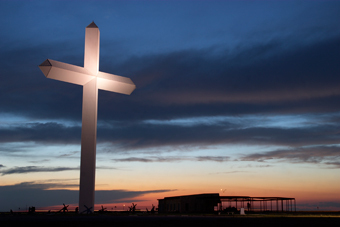 Unsuspecting motorists will often comment, “That is one big freakin’ cross,” but those in the know just call it “The Cross.” It towers over the west end of Groom, a small town with not much else to put on the travel brochures but a diner called Blessed Mary’s. 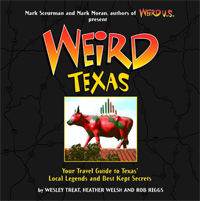 It was surely built to inspire the good Samaritan in us all, or at least those traveling Interstate 40, but its rampant gigantism has probably done more to secure its status as yet another wild roadside attraction. Erected along the Mother Road, it joins the Wigwam Motel, the Blue Whale and Cadillac Ranch in America’s prestigious collection of Historic Route 66 kitsch. The Cross is a knee-bending 190 feet tall and 110 feet wide. The frame is covered in corrugated steel, the same stuff one might use to make a tool shed. It’s like someplace you’d keep your rakes––the really long ones. Electrical outlets near the base lead one to believe accessories may be available for purchase in the future. Of course, the big one isn’t the only cross you’ll see here. 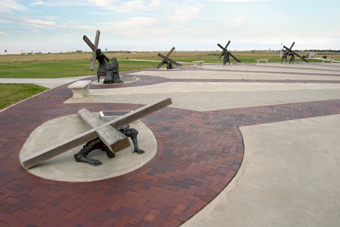 Circling the base are a collection of impressive bronze statues depicting the 13 Stations of the Cross, including Jesus carrying the cross, Jesus falling with the cross and Jesus being nailed to the cross. Several yards away stands a portrayal of Calvary, where Jesus and the two thieves hang from crosses. The cruci-fixation extends even to the property’s light posts, also crosses. And no visit would be complete without a picture next to the aborted-fetus tribute, as well as the replica Shroud of Turin, which the attraction claims is one of only seven in the world. Sadly, most people miss these bonus features. Problem is, the Cross is so enormous, it defeats most attempts to draw travelers off the highway. After all, you really don’t have to pull over to see it. But the Web site appears thankful for an almost 4 percent detour rate. So much for the Ninth Commandment.